Stop overpaying for SAP licences. Start managing your licences based on actual usage. Get visibility and control costs. Get the top 8 tips to help you cruise through your next SAP Licencing Audit. 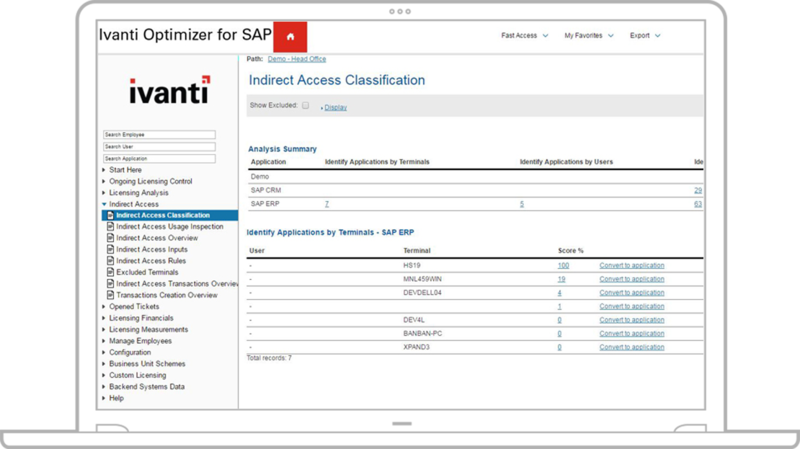 We are very impressed with the savings from using Optimizer for SAP. We were able to identify over 3,000 redundant user accounts as well as identify challenges around our software engine, which we were unaware of. By automating this process, we have saved tremendous amount of manual work. We are so happy we went with Optimizer for SAP. Counting active and inactive users, and relying on manual methods for classifying users and assigning SAP licence types, does not cut it anymore and takes significant organisational resources. 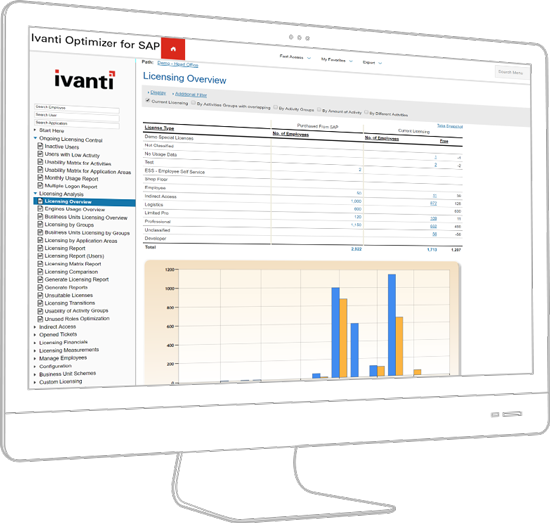 Ivanti Optimizer for SAP provides you with efficient control over your SAP user licences and automates the licence management process while combining user inspection and user behaviour-analysis methods, saving you time and resources. Know who is using SAP, identify indirect access users, and eliminate inactive and duplicate accounts. Explore 5 simple ways to reduce your SAP Licence Spending. Be ready for your next SAP audit. Explore these 8 tips and ace your next audit. Reclassification of licences based on actual user behaviour and not based on hypothetical methods or authorization. Identification of inactive and duplicate users for instant savings and reharvesting of licences. Automatic user-matching across systems and applications to avoid duplicate licence counts. Identification of suspicious user accounts and notifications of potential indirect access. Real-time graphical and statistical presentation of SAP licence utilisation. Detailed audit reports for each user with current and optimised licence classification. Automatic analysis based on usage compared to licencing agreement to ensure compliance. Fast, easy, and non-intrusive installation, external to the SAP systems with no changes needed. Get the insights you need to start licencing based on your actual utilisation of the SAP system and reap immediate benefits from identifying inactive and duplicate users and tackling indirect access. We'd love to help you get the most out of your SAP licences. We are here to answer any of your SAP licence optimization questions. Ready to take the next step and optimise your SAP software investments? Let's talk and find the best solution fit for your business requirements.